You are currently browsing the tag archive for the ‘Geanology Societies’ tag. 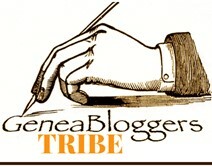 The Federation of Genealogical Societies Conference logo is my inspiration for this prompt blog post. To me, it absolutely epitomizes the event theme, Connect.Explore.Refresh. Explore – Representing the spirit of exploration and discovery, the leaves signify the countless hours of research, lovingly undertaken to expand our knowledge of the men, women and children who populate our family histories. Refresh – And because everyone knows that a tree cannot grow and thrive without nourishment, the unseen element of this illustration are the roots which anchor it and provide refreshment. Our roots are our ancestors, whose lives have given us inspiration and courage, awakening in us a sense of adventure as we climb our family trees … and reach out to others, as the figures in the logo are doing, to join us on the journey. Please make plans now to join your fellow adventurers Feb. 11-14 for the FGS and Roots Tech combined conference in Salt Lake City. Check out the schedule, the speakers and array of tracks to choose from. Whether you are just beginning to explore your roots or are looking down from the top of your family tree, this event just might be the genealogical high point of 2015 for you. Are you going to the FGS and Roots Tech event? I’d love to know which surnames you’ll be representing and researching! This weekend, we attended a genealogy workshop sponsored by the Genealogy Friends of Plano Libraries, Inc. Held monthly, each program is full of good information and is an excellent opportunity to meet others who are researching their family trees. The topic for Saturday was Wow, Whoa, Yikes! and dealt with internet research. Sandra Crowley put lots of personal examples into her presentation and provided handouts full of great websites to visit (available through the link above). Since many of us spend more time in front of the computer than at a courthouse, digging through the attic or exploring cemeteries, we all thought this was a morning well spent. Now I’ll just have to remember to document every URL I go down because it’s so easy to get lost in cyberspace! I’d like to know: have you found genealogical societies to be supportive and helpful in your family tree research?